Set up a network of trail cameras to monitor crop fields which have consistently hosted crop circles in summers past. Several characteristics of present-day trail cameras would suggest that these may be ideal tools for recording crop circles at the time they appear. These cameras can be loaded with batteries which will then provide the power they require all summer long. Trail cameras are purpose built to be weatherproof. Many models are now able to capture images using IR technology at night. Activation of these cameras is via the detection of a temperature difference between a heat source and the ambient air. Crop circles may involve the generation of heat which might serve to activate a trail camera if within its range of detection (typically around 50 feet). Trail cameras of today may be set to provide either infra-red night shot photographic or video images. Data is stored on a 32 MB SD card which can be locked inside the unit and therefore relatively inaccesible to all but those willing to vandalize the camera to gain access. These devices may be the ideal tool to capture evidence explaining the agency involved in the creation of a given crop circle. My research indicates that the Leupold model RCX-2 may be the trail camera of choice due to several reasons: 1) This trail camera has a 10 Mega Pixel camera providing HD resolution photo or video IR night shot images. 2) It has a controller which allows one to view exactly what the camera will view when the camera is initially set up. 3) Data can be quickly downloaded onto the controller SD card and reviewed at home. 4) The cost of each unit is around US $200, plus around US $50 to provide the required 32 MB SD card. CCRF hopes to participate in funding the placement of such a trail camera network to monitor pre-selected crop fields over the coming crop circle season. Complile meteorological data, phase of moon data, and dates of discovery of crop circles over past 2 decades. Assign a “complexity rating scale” to crop circles. Determine if any correlations between crop circle dates of discovery, phase of moon, cloud cover (more darkness), rain (inclement weather), and assigned crop circle complexity score can be demonstrated. If most complex crop circles have appeared over nights of most darkness, more cloud cover, or inclement weather, this would suggest a reduced liklihood that these more complex crop circles were man-made. Greater compexity correlated with more ambient light, better weather, less cloud cover would suggest human activity as the underlying mechanism. CCRF is unaware of any studies to date which have examined microbiologic cultures of the bacterial flora of plant samples taken from within a suspected “Genuine” Crop Circle and compared them with results obtained from those of plant samples taken from known, human made (“stomper”, or “control”) crop circles. Plant samples taken from within the confines of a selected study Crop Circle boundary, from within the confines of a known human-made (control) crop circle boundary, and from plants taken from a nearby location outside of any Crop Circle would be gathered separately and maintained in sterile containers labeled “Study Crop Circle Laid Crop”, “Study Crop Circle Unlaid Crop”, “Stomper Laid Crop”, “Stomper Unlaid Crop”, and “Control Crop”. Differences in microbe absolute counts, predominant microbe specie distribution, and/or spore viability between plant samples taken from”Genuine” Crop Circles (both laid and unlaid plants) and crop circles of human origin (“stompers”) may be demonstrable and serve as markers to distinguish “Genuine” Crop Circles from “stompers” of human origin. Why? The findings reported here lend further support to a decade of research which suggests that over 95% of worldwide crop formations involve organized ion plasma vortices that deliver lower atmosphere energy components of sufficient magnitude to produce significant bending, expansion and the formation of unique expulsion cavities in plant stem pulvini, as well as significant changes in seedling development. Here we demonstrate that, in a number of formations, quantitative node alterations can be directly related to fundamental concepts of electromagnetic energy absorption through the atmosphere. Also, in a detailed field study of simulated crop formations, we show that overfertilization or gravitropism cannot account for observed physiological alterations. In addition, we demon strate that details of flattened, intertwined crop patterns can be described by the application of fluid dynamic principles governing the interaction of rectilinearly moving vortex pairs. It has been known for decades that exposure of microbes to boiling water or pressurized steam results in sterilization, a process carried out in autoclaves. If the energy to which plants found inside “Genuine” Crop Circles are exposed is of sufficient magnitude to produce steam formation within plant tissue and the resultant pressure- induced expulsion cavities that have been previously described, then reductions in microbe survival or reproductive viability might possibly be demonstrated utilizing standardized plant samples taken (employing all principles of sterile technique) from “Genuine” vs. “stomper” Crop Circle formations. Study plant samples would need to be acquired in a time sensitive manner to avoid sampling error due to wind born microbe contamination. A research protocol detailing how plant samples are to be acquired and processed in order to obviate the possibility of sample contamination would be required, and collaboration with a microbiologist is recommended. Evidence for the concept that superheating, accompanied by steam generation within plant tissue, may occur at the time of “Genuine” Crop Circle formation is supported by an anecdotal eyewitness report of a “mist” noted over a “Genuine” Crop Circle’s formation occurring in real time over a relatively brief 20 minute (estimated) time period. ( See Linda Moulton Howe Earthfiles, October 15, 2009: “Woman (M) Witnessed Formation of Crop Circle Opposite Stonehenge”). It may well be that the “mist” described by “M” was in fact steam produced in the high energy process of “Genuine” Crop Circle formation. 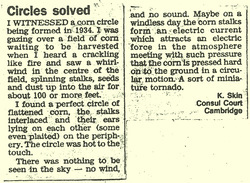 Here is a report od an eyewitness who described her experience of witnessing the formation of a crop circle while it happened. A report of an eyewitness account of a CC being formed. Witness reports that “the circle was hot to the touch”. Further, reports of the discovery of the dessicated remains of a porcupine, “exploded birds” (Crop Circles, The Greatest Mystery of Modern Times, Lucy Pringle, 1999, as reported by Linda Moulton Howe in Earthfiles “A New 1999 Book About Crop Circles”, October 29, 1999) and insect bodies, some also “exploded”, discovered dead and adherent to plant stems ( The Deepening Compexity of Crop Circles, Eltjo H. Haselhoff, Ph.D., Frog,Ltd., ISBN 1-58394-046-4) found inside Crop Circles further imply a highly localized, high energy state achieved momentarily at the time of “Genuine” Crop Circle formation. Insects discovered “welded” to seed heads were not discovered on plants located outside of the crop circle boundary. This same energy, applied to exposed microbiologic flora within a Crop Circle, may have a similar effect resulting in microbe / spore lysis and loss of viability through the superheating of their water content (68 -72% water) and steam production, resulting in relative sterilization of plants (especially “laid” plants) found within the highly precise Crop Circle boundaries. Study of plant water content may help determine which Crop Circles are “Genuine”. 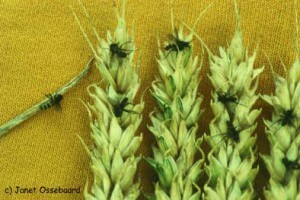 Wheat Seed Head Conformation. As reported at http://earthfiles.com on August 23, 2010, Charles Mallet of the Silent Circle Information Center has very recently pointed out a new observation in the Whitefield Hill formation of August 4, 2010. This formation is suspected to be a “Genuine” Crop Circle. Mr. Mallett’s observation is that mature wheat seed heads in the “laid” plants of the formation all appear to be irreversibly straightened in contrast to the seed heads of control plants which are uniformly bent over. This new observation needs to be studied as a possible marker for a “Genuine” Crop Circle. If this feature is consistently found in suspected “Genuine” Crop Circles and cannot be reproduced in “stomper” crop circles, it will help serve as yet another marker to distinguish “Genuine” from “stomper” formations. CCRF postulates that additional unique markers can and will be discovered that will provide irrefutable evidence that the “Genuine” Crop Circles are indeed signposts of contact by one or more other intelligent civilization(s) now visiting Earth. Scientists: CCRF is eager to review your proposals of research protocols which you believe may be fruitful in acheiving our goal of proving, beyond reasonable doubt, that a subset of Crop Circles are not produced by human beings and must therefore be the product of another intelligent civilization who are attempting to make us aware of their existence. Please send in your proposals/ideas/musings/inspirations and your contact information. *”Stomper”**: A primate of lower integrity and intelligence seeking personal satisfaction and perceived self-agrandizement in pursuing, “for fun”, the illegal vandalism of farmers crops through the (“stompers”) primitive practice of the”stomping down” of living (and food providing) plants into patterns they HOPE will further delay our true understanding of the Universe in which we reside.